My vineyards are located on plateaus, on the plain, and on slopes that descend in gentle waves. The soils are usually rocky, but also sometimes deep. The sites are frequently sun-drenched and warm, but some are cool and shady. Some are suited for Blaufränkisch and Pinot Noir, while others for Welschriesling and Pinot Blanc. Many are based on limestone, some on schist, and yet others on cambisols. Each site has its own story. You just have to give it the chance to tell it. 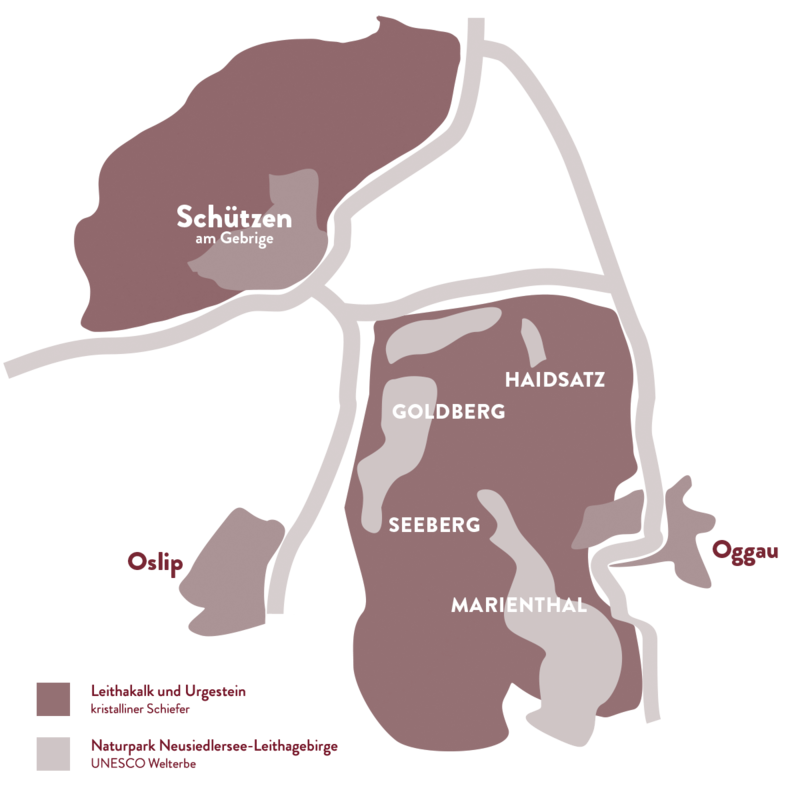 Goldberg is indisputably the best vineyard in Schützen am Gebirge and was first mentioned in documents dating 1555. The name speaks for itself. Although, one should replace the gold on the berg (mountain) with mica schist, because that it the real foundation of this site. The Goldberg turns away from the lake and is exposed to cool thermal breezes that waft across the Leitha Mountains from the north. Because schist soils warm easily, a warm-cold contrast is created in an opposite way: cool soil + warm air = Marienthal, warm soil + cool air = Goldberg. The resulting large temperature differences are reflected in the wine. Through its unique coil conditions and microclimate, Goldberg is an ideal site for sultry Blaufränkisch with impressive aroma complexity and immense ageing potential. The name of today’s Ried Marienthal can be traced back to 1881 and it is one of the oldest and most famous sites on Lake Neusiedl. The vineyard was evidently on everyone’s lips even earlier. In the year 1476, it was called “Marchteil” and stems from the Old High German term “Mark”, which means “border”. Locals call the approximately 10.3 hectare vineyard “Moaritoal” in our dialect. If you look from Marienthal toward the east, Lake Neusiedl spreads in front of you and behind it the Pannonian Plain. If you take a close look at the soil, you see calcareous sand and small pieces of limestone. One metre deeper you find chalk, particularly in the rather steep part of Marienthal in Oggau where my vines grow. Warm Pannonian air masses that encourage vine growth meet cool soils that slow growth. This tension creates wines that are also marked with a particular antagonism. Immense power is buffered by vibrant acidity, abundant tannin, a delineated texture and an intense play of fruit. The Ried Haidsatz has quite a long history. Documents from the 15th century praise the site for its exceptional vineyards. 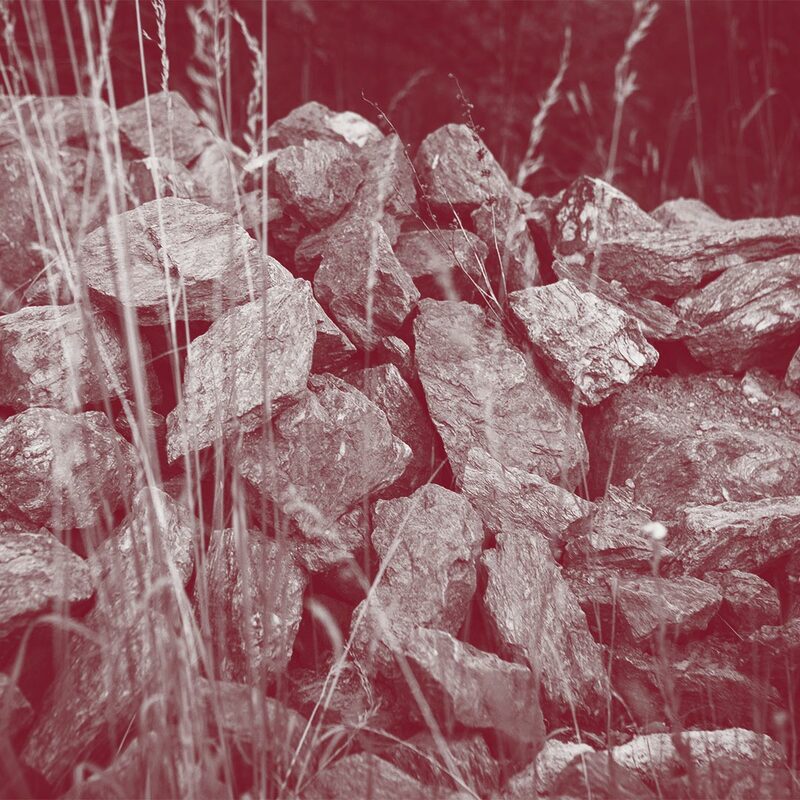 Being particularly suited for well-grounded white wines, it had to leave the limelight to other vineyards for decades during the Burgenland red wine boom. Only in recent years is it once again on the stage with complex and expressive wines. The site is based on a mixture of limestone and schist, more explicitly a layer of limestone over a slab of schist. It is located in the middle of the Schützner Stein. It is exposed to the cool northeast winds, which influence ripening positively by prolonging it. The resulting Pinot Blanc from this site has a juicy texture and a powerful spine. Ried Seeberg is a plateau that is located 50 metres above Schützen and 180 metres over sea level. A sea covered this site millions of years ago and when it receded, it deposited fossils and mussel shells. Today this forms the enormous layer of limestone on which this site is based. Thanks to its geological composition, the soil absorbs and stores moisture perfectly and ensures good vine nutrition. The topographical attributes guarantee the vines sunshine and winds with warming and cooling effects, which are both reflected in the wines.